Transport for The North’s ‘Northern Powerhouse Rail’ is a classic example of a politically-led project in which rational considerations have been over-ridden, according to rail consultant Paul Salveson. Members of Leeds city council’s executive committee have claimed the main reason for HS2 is to increase capacity on the rail network, the Yorkshire Post reported. The idea that HS2 is about ‘Leeds rail capacity’, ‘West Yorkshire rail capacity’, or ‘solving rail gridlock’, is nonsensical. Rail capacity across northern England is restricted by short trains, substandard signalling, and poor track layouts. Building HS2 would address none of these issues. An argument often put forward about both the Randstad and Rhine-Ruhr is that their transport links allow people to live in one city but work in another, suggesting that there would be benefits for the North of England in strengthening transport links between cities. But the data suggests that people don’t use the transport links in this way. The travel patterns across all three areas, appear to suggest that if a worker wants to live in a city, they will mostly choose to live in the city that they work within. Otherwise they will choose to live in the countryside surrounding the city they work in, rather than another city. The speeds achieved by intercity rail connections between the cities of the Randstad and Rhine-Ruhr are not a great deal quicker than between cities in the Northern Powerhouse. On 13 September, BBC News and its Look North tv show reported on the modernisation of the 69 km Transpennine North railway between Leeds, Dewsbury, Huddersfield, Stalybridge, and Manchester. Passengers on TransPennine trains will face five years of major disruption during a planned £2.9bn upgrade of the route, a leaked letter has revealed. The letter from Network Rail to Transport Secretary Chris Grayling said there would be line closures for 39 weeks a year from 2020 until 2024. The letter from Rob McIntosh at Network Rail, says the route is “a Victorian construction that passes through the heart of the Pennines with its inherently challenging topography”. The minister is warned that access to the many tunnels and bridges along the routes “will be limited and difficult”. But the ‘level of ambition’ for the TPN upgrade, is yet to be disclosed. Although the line ‘will be electrified’, according to reporter Spencer Stokes, that might just mean from Leeds to Huddersfield (27 km). In that case, all trains would have to be bi-mode or diesel, to move between Stalybridge and Huddersfield (29 km). Surely, there would be little to no point in such ‘Cispennine electrification’. 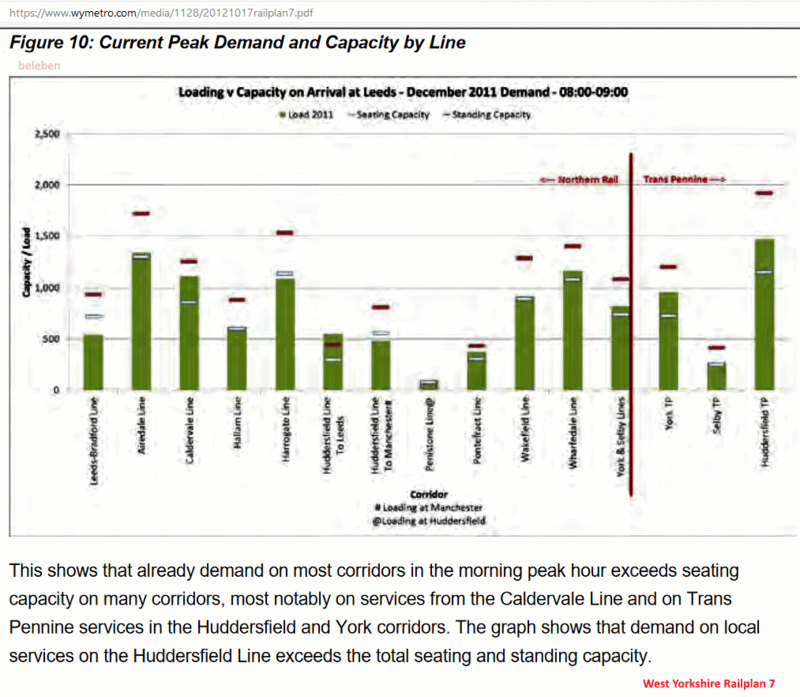 increasing capacity at Leeds and Calder Valley stations and enhancing Huddersfield and Stalybridge stations. Whatever the level of ambition, upgrading the TPN route would be far less disruptive than building a new line from scratch across the Pennines (‘Northern powerhouse rail’). For NPR, everything would have to be brought to and from site by road, meaning tens of thousands of HGV movements. So why not scrap the ‘plan’ for NPR, and use some of that money for a proper upgrade of the Calder Valley and Transpennine North lines, including full electrification? If a 35 minute journey time between Manchester and Leeds is achievable from a capability uplift on the existing line, why would anyone, apart from deluded wonks and nutjobs, support NPR? What is the thinking behind Northern powerhouse rail? transform the northern economy and meet the needs of people and business. It will transform connectivity between the key economic centres of the North. The programme promises radical changes in service patterns, and target journey times. By delivering NPR more than 40% of businesses identified as having the North’s prime capabilities would be within 90 minutes rail travel of four or more of the North’s largest economic centres, compared with only 12% today. Currently fewer than 10,000 people in the North can access four or more of the North’s largest economic centres within an hour. This would rise to 1.3 million once NPR is delivered. NPR would transform the job market, giving businesses access to skilled workers in larger labour markets and offer individuals the opportunity for flexible career development and progression, all within the North. However, TfN’s January 2018 draft Strategic Transport Plan stated that “the North is home to 16 million people”. It is entirely unclear why it would be worth spending billions of pounds, just so that 8 per cent of the population of “the North” could “access four or more of the North’s largest economic centres within an hour”. John Armitt, of the National Infrastructure Commission, described TfN’s strategic plan as a ‘major step forward’. Which says quite a lot about John Armitt. * To drive innovation in rail through the creation of a critical mass for investment in new smart ticketing and information systems which can be used by all rail operators. Although the ‘Evidence Base’ runs to 83 pages, there is no actual evidence in it which supports the ‘vision‘ for Northern Powerhouse Rail. The topology is questionable, and the target frequencies, and target journey times (e.g. ‘Sheffield to Manchester in 30 minutes’) seem to be round numbers plucked from the air. Evidence about corridor demand, capacity utilisation on the existing rail lines, etc, is conspicuous by its absence. In its current form, ‘Northern Powerhouse Rail’ is a dreadful project which would do almost nothing for everyday transport in the north.